If you have any issues with the mod, please read this before posting. It might save you some time. If the mod doesn't work for you, make sure you followed the installation instructions correctly and you went through all the troubleshooting steps from the description tab, before posting. If you post about an issue make sure to let me know all the steps you took in trying to fix the issue. Thank you all for taking the time to provide feedback, endorse and vote! It's amazing to see all this support and appreciation. Question: Does it pause music as well in cutscenes? It still works in Steam ver1.32. Definitely a life-saver mod. Ty so much for creating this. When I press Escape during a cutscene/dialogue the sound plays (the same as while opening the menu) and the screen flashes very briefly but the cutscene continues and the menu doesn't show up. Looks like the menu might be opening and closing immediately. SAME PROBLEM, PLS HELP! HAVE ANYONE FOUNDED THE SOLUTION? 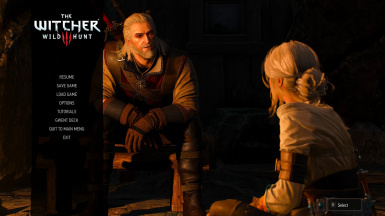 This is an old post, but FWIW I had the same exact problem and using the Script Merger (https://www.nexusmods.com/witcher3/mods/484) fixed it for me. Works like a charm now. I've got the Steam GotY version. Thank you! You literally addressed the ONLY issue I personally have with the game. Go figure the only time my attention is needed away from the game is when I start a dialog. Any other moment I'm left alone. This allows me to avoid missing any conversation details... Even though I've beaten the game well over 9 times. Was really looking for this and the mod is very useful. While editing the input settings I noticed there is a mouse damping entry in the scene hack section which I understand is the heavy mouse movement effect in the cutscenes. I have been looking to have damped smooth transitioning mouse in game as well since both the options available in game are too raw and jerky. Perhaps there is a way to enable this damping in the game as well but with less magnitude like 1/5th of it? Something like how the camera gently transitions when the horse is on autopilot. I installed the unification patch and had trouble getting the game to start. I traced it down to this mod, when I uninstalled it I could launch the game. I uninstalled the steam version and did the GOG GOTY an it works for me now. Thanks for saying how you got it to work. I own the Steam version of the game, but I was only able to get this mod to work by following what you said. Otherwise I would keep getting a error saying the scripts don't know how to read. "IK_Pad_Back_Select=(Action=IngameMenu)"